I love Christmas, but I hate the Christmas shopping season. In my neck of the woods, Christmas decorations went on sale in August. August, blast it. Anyway, realizing that, and that black Friday is coming up, I won't be doing a Thanksgiving day blog, and I don't have too much to add to my past blog entries on the matter. However, if you want to know about cooking for 93, or the authors I'm thankful for.... you can check those out. While I finished my Christmas shopping months ago (writers do it all year round -- write your own joke here) I understand that there will be an onslaught of people who are going to be trampling each other in order to get gifts for family and friends. With that in mind, it occurred to me that this is going to be a great time to compile a list of suggestions to make your shopping lives easier -- if not for this Friday, then for the upcoming Cyber Monday. Some of these are books I've reviewed, and others are new even to me, but have come recommended to me. So, unless you're going to go out and buy some Darren Brown tickets, you might want to try some of these items below. 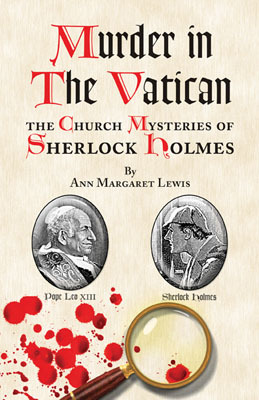 Murder in The Vatican: The Church Mysteries of Sherlock Holmes -- if you've been reading my blog for a long time, you know that I loved this one, and I can't possibly recommend it enough. Mind Over Mind -- The short version? "No, he's not crazy, aliens really are messing with his brain." Night Machines by Kia Heavey .... this one sounds interesting. Almost Doctor Who-ish by way of Rod Serling. Who would it hurt, if Maggie decided to carry on a torrid affair in her mind? It would soothe her feelings, hurt by her husband's emotional abandonment while he investigates a disturbing new murder case. It would provide an outlet for the dizzying desire she feels for her employer. It would make her feel loved and appreciated and better able to be a good wife and mother. After all, it's not really cheating if it's only a fantasy. Right? But Maggie loses control of the fantasy as lust becomes love, and things she believed confined to her own imagination are somehow known to her spectral lover. A harmless mind game spins out of control and threatens the sanctity of Maggie's greatest treasure – her family. End of the road, by Amy Bennett: This looks like a fun one, a straight up, old fashioned murder mystery......Corrie Black, owner of the Black Horse Campground, hopes for a successful start to her summer season but the discovery of Marvin Landry, a long-time guest, shot dead in his own RV, along with $50,000 in cash missing, does not herald a good beginning… especially since the victim’s handicapped wife and angry stepson seem to have little interest in discovering who murdered him. Was Marvin’s murder planned or just convenient? And is the appearance of a mysterious biker with a shadowy past that includes a recently deceased wife merely a coincidence? Despite opposition from former flame, Sheriff Rick Sutton, Corrie is determined to find out who murdered her guest. But will she find out who is friend or foe before the murderer decides it’s the end of the road for Corrie? Five Lessons from the Carmelite Saints That Will Change Your Life... I think the title is self explanatory, don't you? Fools, Liars, Cheaters, and Other Bible Heroes... again, self explanatory. If you have something you'd like to suggest for gifting opportunities, please feel free to mention it below. Just keep in mind, I do moderate the comments, mostly due to a problem with spammers and schmucks from a few years ago, so if your comment doesn't appear immediately, it's probably because I'm not glued to the computer. These are links to my husbands books. I write fir the Charlotte NC diocesan newspaper and am working on my first non-fic book. Thanks for considering posting. All are ok for high school age and up. Thank you for the idea, sir. I'm linking to your page with my own "Cyber Monday" page next week. Happy shopping, all! Hi, John! Great idea, and great list! I'd like to add my books to your list. They are a wonderful mix of suspense, explorations of human relationships, unexpected twists, and Catholic characters struggling to live out their faith. They are not sweet stories as they deal with difficult subjects, but they are uplifting. All four are stand alone, but preferred order is: Hijacked, Unholy Bonds, Opal's Jubilee, and a holiday novella, Christmas Hope. Thanks for allowing others to share on your blog!